3 Beds 2 Baths 1,658 Sq. ft. 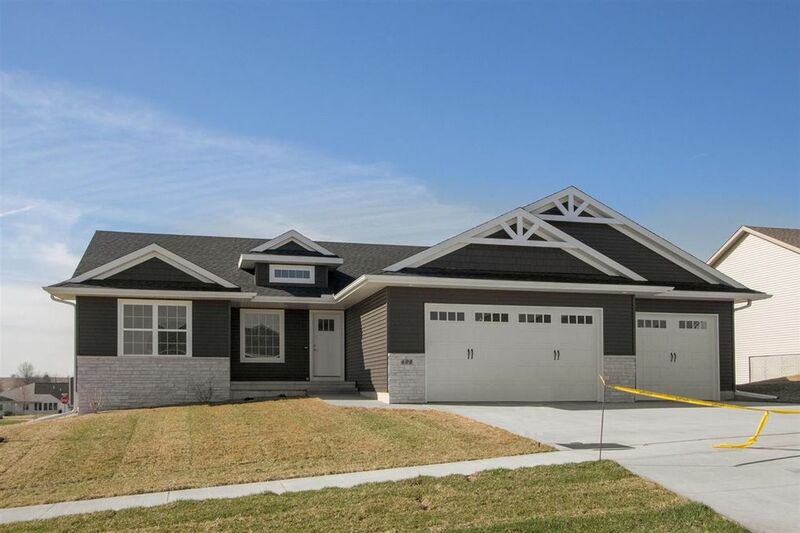 Stylish new construction in the growing town of West Branch located within 14 minutes to down town Iowa City in the desirable Pedersen Valley neighborhood! This wonderful walkout ranch features soaring cathedral ceilings through much of the main level; custom floor to ceiling stone fireplace; fantastic kitchen that boasts premium soft closing white maple cabinetry, shiny granite countertops, island with breakfast bar, subway tile back splash, under cabinet lighting, stainless steel appliances including a gas range/oven, and a convenient pantry; wonderful master suite that boasts a designer ceiling, full bath room and an 11 ft. deep walk-in closet; warm luxury vinyl plank flooring through the main level; white panel doors and painted trim; chrome plumbing fixtures along with brushed nickel hardware and lighting fixtures; rounded drywall corners; lots of LED recessed lighting; 6x9 1st floor laundry room with extra cabinetry; quality Gerkin brand vinyl windows; 12x12 deck with metal balusters; plenty of room to expand in the unfinished walkout lower level to include a large family room, 2 more bedrooms, bath room and still plenty of storage; oversized 24x34 (3) car garage; high efficiency Lennox equipment; and an attractive exterior featuring stone, shake, and special design feature accents! The buyers will qualify for up to 5000 in City tax credit/incentives! Directions: Herbert Hoover HWY, left on Pedersen St, left on Orange, right on Gilbert, left on Sullivan.